Nutritional Therapy Rocks - A healthier lifestyle begins now! You can change your life in a few simple steps! An avo a day helps keep the doctor away! Nutritional therapy can support a wide range of issues including digestive complaints, fatigue, headaches, low mood, low energy, food intolerances, stress, hormonal fluctuations and weight management. I provide friendly, motivational one-to-one nutritional consultations to advise you on healthy eating and lifestyle practices to enhance your ‘joie de vivre’! After booking your appointment, you will be sent a Questionnaire to fill in so I can assess and research your case before we meet. Dietitians work principally in the National Health Service and are regulated by the Health and Care Professions Council. Their professional body is the British Dietetic Association. A dietitian uses the science of nutrition to devise eating plans for patients to treat medical conditions. Registered Nutritional Therapists use a wide range of tools to assess and identify potential nutritional imbalances and understand how these may contribute to an individual’s symptoms and health concerns. Registered Nutritional Therapists consider each individual to be unique and recommend personalised nutrition and lifestyle programmes rather than a ‘one size fits all’ approach. NB. Registered Nutritional Therapists are trained in clinical practice to give one-on-one personal health advice and must practise with full professional indemnity insurance. My Mission - to 'hear' my clients individuality and work with them to improve their symptoms step by step back to health & happiness. My Vision - to help my clients attain optimal health through an optimally healthy gut! Subcribers - NutritionalTherapy.rocks' monthly newsletter......full of health tips and recipes. 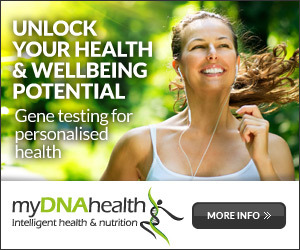 Mydnahealth.co.uk determine your genetic expression through gene testing plus lifestyle and diet questionnaires which help the therapist determine the best recommendations for you personally. Your genes are the first half of the story but lifestyle and environment tell the rest! I am wholeheartedly thankful to Susie for her outstanding knowledge, support and guidance to optimize my health through nutritional therapy, which has been way above and beyond my expectations. I highly recommend Susie to anyone seeking optimal health. Besides the pleasant fact that I have lost 8 kilos since my suggested lifestyle change 2 months ago, I feel more comfortable in my own skin and the little aches and pains have started to disappear. With Susie’s guidance, I made some basic changes to my diet and I felt a huge change for the better very quickly. With her vast knowledge and understanding of nutrition and how our bodies work, I would recommend her service to everybody. The clinic is on the ground floor and fully accessible. Everyone welcome. Under 16s must be accompanied by an adult. A competent nutritional therapist works alongside your GP and any other healthcare professionals involved in your care; permission to contact them may be requested. Supplements and/or tests may be suggested. Appointments may be negotiated outside these hours.